Fox Products, one of the world’s leaders in the making of oboes and bassoons; its products are used in orchestras throughout the world. Whitley Manufacturing, a local company that builds modular buildings, modular schools and classrooms, modular banks, modular offices, and modular dormitories. Janie Fricke, a South Whitley native and 1966 graduate of South Whitley High School. Janie was two-time winner of the Country Music Association Female Vocalist of the Year in 1982 and 1983. She also won the Academy of Country Music Female Vocalist of the Year in 1984. If you wander just three or so miles west of South Whitley either by driving Indiana State Road 14 or by taking a more leisurely drive on a rural backroad known as the “River Road”, you will come to one of my favorite childhood places – the Collamer Dam. 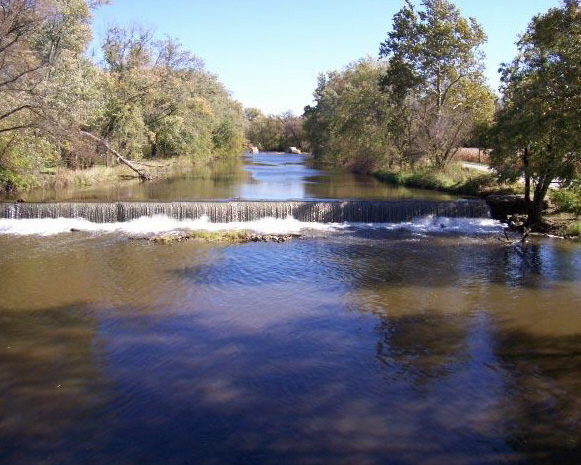 The Collamer Dam is located in Collamer, Indiana, and, like so many other dams in our early history, was constructed to provide water power for a gristmill. Collamer was once a thriving town with a gristmill, a sawmill, two general stores, a drug store, a boot and shoe store, a grade school, a Christian Church, a physician, and a post office. As a youngster, I remember going into one of the few businesses remaining, the general store located on the southwest corner of the main intersection in Collamer. But sadly, like so many other smaller communities, Collamer is no longer home to businesses but only modest homes that line the intersection for a few thousand feet in all directions. I still stop at Collamer every chance I get to gaze at the waters of the Eel River as they flow and bubble over the dam on their southwestern journey through cornfields, wooded riverbanks, and small Hoosier towns to join the Wabash River at Logansport. The Dam still stands, a little worse for the wear as it ages, but that only makes me feel closer to it as I age as well. This entry was posted in History by Charlotte A. Weybright. Bookmark the permalink. My Grandfather Ivan Roberto Godwin was the miller at this gristmill at Collamer dam in the late 1800’s. He had been widowed and left with 3 children, Mary, John and Rena after his first wife Mary passed away in about 1894 or 1895. He felt called to the ministry and became a Methodist Minister I believe in about 1896. He married my grandmother, Laura Elvira Meeks Godwin in January, 1896, and my mother, Edith Louise Godwin Greenwood was born in October 1896 in the little town of Roann.. In the 1930’s a dn 1940’s we had annual family reunions at the cemetary in South Whitley and the park at Collamer Dam on the Eel River. They were wonderful happy times. I am sorry the mill is no longer there, but the memories will always be with me. Thank you for the wonderful history. I have loved rivers my whole life, and I always found an affinity with the Collamer Dam and the Eel Rive in that location. When I was younger, I would drive out there every chance I got just to sit by the dam and relax. I remember going to family reunions at the pavilion and having such a great time at the park. I also loved the well with the drinking fountain. My grandparents on may father’s side lived in South Whitley their entire lives. My Dad was raised there, and, after he married my Mom, they bought a grocery store. We had the G & G Market for 30 years. My brother and sister-in-law still live in South Whitley. I don’t get back there much anymore, but I do miss it. I now have a home of my own that I bought in the historic West Central neighborhood in Fort Wayne. And, staying true to my love of rivers, I am just across Thieme Drive from the St. Mary’s River. I was just talking to Clint and he said you may have some info about the old South Whitley grist mill. I have one of the old grinding stones and would love to know some more history of it. I don’t have any information handy, but I will do some research. Also, check out the post just above yours. It is from Nate Smith whose grandparents ran the old grocery store. He has a website, and he might have some info. How did you ever get hold of a grinding stone? What a wonderful thing to have. Charlotte. Please help Brent if you can. He loves the history as much as you! I too have fond memories of the Collamer damm and the Eel River. I have a painting of what the mill looked like many years ago. Mac Bechtold had my Aunt Edna Michael paint it for Art at some point. When Mac and Art gave up their home she had it sent to me. I guess Mac had found a photo and had Aunt Edna paint it from there. Of course it has her trademark bird in a tree. My grandfather, who raised me until the age of 13, grew up in South Whitley, Indiana from 1934 to 1948 in a big white house on a hill next to the nickel plate railroad. He loved that place, and I loved the stories he told about his home. As a young girl in the 1950’s and 1960’s, I loved jumping on my bike and riding to Collamer, we’d pack a lunch and eat by the dam. I loved that little town or whatever it was back then. I still love going to the dam whenever I get back. I remember having get togethers at the pavillion, I think the girl scouts used the building at times. To me, it was a place of peace and tranquillity. Karen (Slater) Mansfield, Fort Wayne, IN. Well I too have great memories of Collamer. It was my grandparents on my mother’s side who ran the Collamer Store. I lived there for a couple of years when times were rough for my mother. One of the great memories is when a couple of boys and I decided to play Marines and jumped off the bridge to the sandbar(about 15 feet). Grateful we didn’t break anything. I also remember stocking the shelves in the store, scraping the meat block and watching home movies on a sheet in back of the store by Danny Smith(Nate’s dad). Great Memories. One of the things I remember was your younger sister, Cynthia, and me, walking to Collamer one summer day when we were probably 12 or 13 years old. We told my Grandma Weybright that we were just going for a walk and would be back soon. I guess at that age, one doesn’t realize how long it takes to walk to Collamer. We took the old railroad track – I think it must have taken us several hours – long enough to worry everyone to death. But we survived it – a little worse for the stress we caused. I am always so happy to see that the old trees – or most of them – are still standing on the River Road side. It really is such a peaceful and tranquil place. I am so glad to hear from all of you who remember Collamer. I miss the good, old-fashioned grocery stores. I did a post some time ago when the IGA on Lima Road closed. It just couldn’t compete with the big-box retailers. My brother sent me some old pictures – I need to put them into the blog. The prices were unbelievable – 5 cents for many things. Nate Smith (from above) is giving a presentation on Jacob Willits, whose father ran the store from 1866-1876. I have it in my calendar and plan on going. your parents used To run the G & G supermarket in South Whitley. Understandably, you miss the old fashioned stores. My aunt worked for the Gruewells in the bakery “Derelys Winterrowd”,She was a real nice lady. My other Aunt is Barb Keel, I think she worked for your parents awhile, maybe. She also ran the pizza shop next door for awhile. My other Aunt is Monas Murphy, I don’t know if you know her or not. Did your parents know the Fishers, who ran the Tunker Store, way back when? I am inviting all of you to check out the stores website.I would love to see any photos of the store.I will be uploading app 30 photos on as soon as i get watermarks put on.Unfortunatley some people are copywirting these photos so I must do this.Anyway please click the contact us button.I would love to have a Collamer store weekend so all of you could come in and see the store and share pics.I have an original DX pump and sign inside.! Thank you everybody for the Great reading about Collamer. I remember a few people, from there. Did anybody else know Leroy Fisher & his family ,who ran the General Store in the 1960’s. I think they were called “BIG Daddy’s” and they cost a nickel.